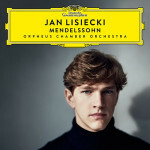 Canadian pianist Jan Lisiecki’s Deutsche Grammophon studio recording of Felix Mendelssohn’s piano repertoire, concertos and solo compositions, featuring the Orpheus Chamber Orchestra (OCO), is working in tandem with his current concert tour. The pianist was back with the Philadelphia Orchestra for three performances in early March. The 24-year old Lisiecki brings much maturity to his interpretive artistry of Mendelssohn piano repertoire. He is proving to be a specialist of the classical-romantic transitional era, interpreting music by composers who don’t fit neatly into either category with “one foot out the door in the classical and one in the romantic”, as Lisiecki so notes in the CD booklet. He brings that overlapping musical sensibility to his recordings of Chopin. The immediacy of his playing is also very present in the studio. The thrilling entrance of the Piano Concerto n° 1 brings a fiery dialogue with the OCO right out of the gate. The Orpheus is famously sans conductor, and as Lisiecki also cites, it gives the players an opportunity for unique clarity and balance when they all weigh in on such a collaboration. At the March 8 performance in Verizon Hall, with Yannick Nézet-Séguin conducting, there were also those same qualities. The maestro bounded onstage right behind Lisiecki who almost shyly bowed to the exuberant applause. But as soon as the tall pianist sat at the Steinway, it was all about the music and his interplay with the orchestra. Lisiecki loomed over the keys, his curly hair bouncing around as he leaned in close to the keys with technical artistry and producing full dimensions and musical daring of Mendelssohn’s Piano Concerto n° 1... That same performance intensity lives on in this recording. The more Romantic Era symphonic drive within the Piano Concerto n° 2 is just as theatrical and interesting for different reasons. The lengthy “Allegro” establishes Lisiecki’s dialogue with the entire orchestra. The soulful “Adagio” movement simmers with emotional intensity while the final movement blooms with an effervescent aura of A Midsummer Night’s Dream. The Orpheus’s depth of sound and inner drive are especially lustrous. But it is the singular dynamic of Mendelssohn’s solo piano composition, Variations sérieuses, that makes this recording most distinctive, especially next to the concertos. Lisiecki displays the particular interpretive skill of an under-recognized masterpiece. The unpaused, wending of 17 miniatures are laced together and are spellbinding, both compositionally and in Lisiecki’s studio performance. Careening from classical andante, to filigree shadows of the Baroque, Mendelssohn must have been heard as a wild piano expressionist in his era. He was definitely a fusionist of modernist riffs on classical forms: allegro, agitato, cantabile, adagio, vivace, moderato, etc, and some just marked by numbers. Lisiecki soars in Mendelssohn’s adventurous musicality. The recording concludes with the romantic esprit of the Rondo capriccioso, played for all of its wry theatricality, and the finale of the Songs without Words in G minor (“Venetian Boat Song”) which Lisiecki performed as a most haunting encore in Verizon Hall for a rapturous Philadelphia audience.